PHILADELPHIA -- Defense wins championships. Sometimes. Other times, as recent history has shown, it's elite quarterback play that gets the job done. So what happens when you pit those two things against one another? Sunday's wild-card game between the Philadelphia Eagles and Chicago Bears (4:40 p.m. ET, NBC) features a marquee matchup between the league's top-rated playoff quarterback, Nick Foles, and the most dominant defense in football. Since making his first postseason start in 2013, Foles has a better QBR (82.3) than any of the 11 QBs who have made a minimum of four postseason starts in that span, according to ESPN Stats & Information research. He has the highest postseason completion percentage over that time (71.9) and the third-highest yards per attempt (8.4). 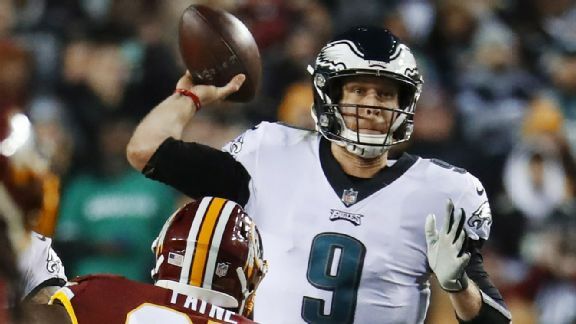 The bulk of those numbers were generated last season, when Foles threw six touchdowns and an interception in the playoffs to lead the Eagles to their first Super Bowl title. Nick Foles has been among the best quarterbacks in the NFL over the past three games. He comes into this game red-hot. Taking over for an injured Carson Wentz in Week 15, Foles ranks first in the NFL completion percentage (77.0) and passing yards (962) over the past three games, guiding Philadelphia (9-7) to three consecutive victories and a surprise playoff berth. “They’re an extremely talented defense," Foles said. "I’m really impressed with what I see from their front, from their secondary, from their linebackers. They do a great job with vision. The reason they have a lot of turnovers is the pressure they can cause up front which causes a little havoc, quarterbacks holding onto the ball." The Bears (12-4) rank third in sacks (50) and sixth in forced fumbles (18). At the center of that havoc is Khalil Mack, who posted 12.5 sacks and 18 QB hits in 14 games for Chicago this season. Eagles tight end Zach Ertz referred to Mack as a "monster" and one of the top three defensive players in the league along with Aaron Donald and his teammate Fletcher Cox. Ertz pointed out that Philly is well-equipped for the challenge, with arguably the top right tackle in the league in Lane Johnson and a potential Hall of Famer in Jason Peters holding down the left side, but added that he wouldn't be surprised if he's asked to chip Mack, especially early in the game. Even with additional help up front, Foles needs to continue to get the ball out fast. He's been as good as just about anyone in that department over the past three games, ranking second in average time before pass (2.46 seconds) and average time in the pocket (2.04 seconds), according to ESPN Stats & Info data. That, plus improved play from the offensive line, has led to a league-low pressure rate of 17.1 percent. The Bears' scheme can certainly slow a quarterback down. Defensive coordinator Vic Fangio is an expert and mixing and disguising coverages. As Foles put it, "They're going to try and confuse my eyes." Chicago has been incredibly effective at confounding the quarterback this season, leading the league with 27 interceptions -- six more than the next-closest team (Miami). Foles versus the Chicago defense is strength on strength, which should make for fascinating theater.